The Midsummer¹ season of festivals and feasts – the Summer Solstice, St. John’s Eve, and St. John’s Day – have always resonated with me and filled my imagination. As the sun reaches its zenith on June 20/21, and then the feast & festival of St. John the Baptist follow a few days later on the 23rd & 24th, it’s a sun-drenched, liminal time of thresholds being crossed and whispers being heard. The solstices and equinoxes, as well as the festivals surrounding them, provide an opportunity to celebrate the threshold and revel in the thin places. And what more verdant and prolific a time than Midsummer, when we’re picking strawberries out of the field, gathering chamomile, watching the world greening before us? Last Midsummer, I finished up a project that had been a labor of love for quite some time – I’ve shared some photos from this collection before, but I’ve never really sat down to talk about them and put them into their narrative context, as each piece was created to tell part of a single story. The series ended up being especially dear to my heart (perhaps partially because it marked my first attempts at so many new-to-me methods of creating), so it has a special place in my studio. Shall we walk through a Midsummer story together? The air is filled with a delightful fragrance – a crisp burst of citrus, sweet floral perfume, and the lush scent of sun-warmed strawberries…in preparation for tonight’s Midsummer festivities, Mouse is preparing a refreshing elderflower & strawberry cordial, which so perfectly captures the tastes of the season. This little ‘Elderflower Cordial’ Vignette may very well be the first Vignette I ever drew – the thought of creating tiny drawings depicting glimpses & moments of a magical world had been swimming around in my head for awhile, and little mice with sprigs of elderflower were the first to work their way into those drawings. This piece was one of the first few paintings I had attempted on wood panel. I always used to paint on canvas – textured canvas, in particular, because I loved the organic feel of the acrylic texture – so I had to work through some learning curves in painting on a smooth panel, but I ultimately fell in love with the process. My vision was for this painting to have the feel of a stained-glass window in the illumination behind the birch trees. ‘Midsummer Celebration’ paper-cut Scene in daylight – the string of ‘lights’ & the lantern can be rehung on the trees in various spots. 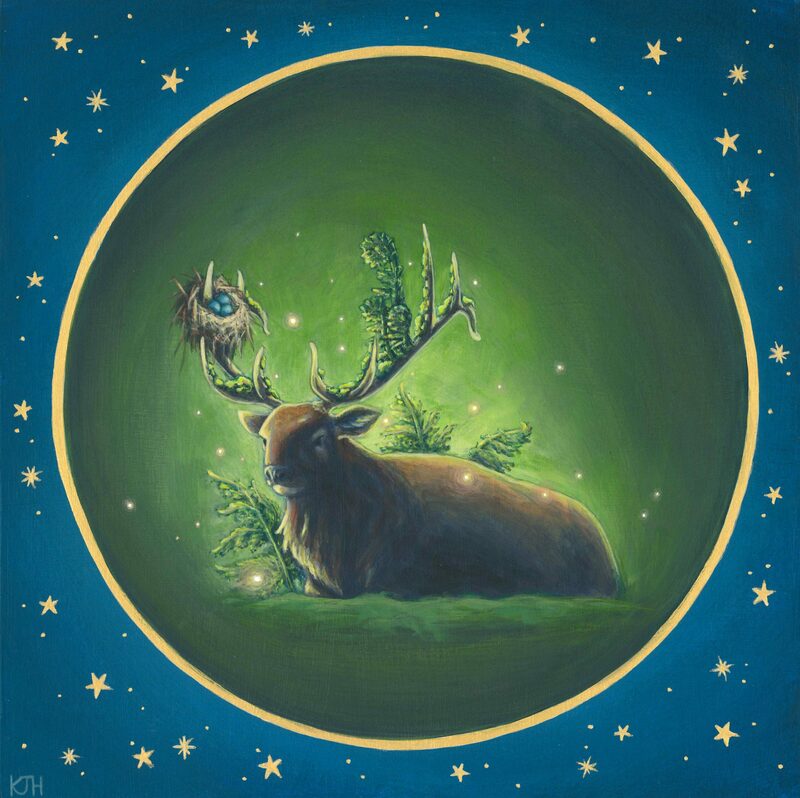 The yellow orbs of illumination behind the lantern and the candles atop Deer’s antlers are removable – velcro attaches the illumination pieces to the paper, so one can “light” the candles (these orbs were painted on clear plastic, so light shines through them). The strawberry shortcake and wreath of St. John’s Wort can both be moved and attach to other pieces in the set. ‘Midsummer Celebration’ paper-cut Scene illuminated at night – pinholes were poked in the starry night sky background, and a battery-operated candle provides illumination from behind. Under the starlit canopy of the Midsummer sky, Fox and Deer – bedecked in St. John’s Wort – gather in celebration, awaiting the rest of their company. A warm summer wind flutters through the birch grove as our forest creatures partake in the splendor of this plentiful season…they find that a shortcake, filled with flavorful wild strawberries, awaits them under the soft glow of a string of lights. Ah, this paper-cut scene…much love went into it. It consists of 5-6 layers of depth, depending upon how it’s set up. I started by doing rough sketches of the scene as a whole, then breaking those sketches up into the various layers I wanted to create. I then drew the forms for each layer on watercolor paper and handpainted each piece with acrylics. I used an x-acto knife to cut everything out and a pin to poke holes in the stars. All of the pieces can move around, with accessories like the strawberry shortcake being able to be placed on various spots. As mentioned in the caption above, the orbs of illumination behind the lantern and the candles on Deer’s antlers are attached with velcro, so you can “light” the candles. It took a bit of engineering to get everything to stand properly – some backing reinforcement on the trees, for example – but it all came together. Thank you for following along on this Midsummer journey…it’s such a pleasure to finally take the time to share it with you in more detail. I hope that you’ve been enjoying a wondrous & joyful season! Although the originals from this series are fixtures in my studio, prints of ‘Midsummer Sojourn’ are available in my Etsy shop! Thank you Lindsay, you’re always so kind! I’m so touched to think that my little Midsummer collection captured a bit of that day’s enchantment for you!